Innsbrucker Kommunalbetriebe AG (IKB) invest into a HUBER Belt Dryer BT 16. The positive energy balance of the wastewater treatment plant, one of the most modern plants in Europe, is further improved with a customised heat concept. The trend towards more extreme weather has become ever more apparent in the past years. In many regions, fewer precipitation events occur on average per year but these are more severe. Read in the following article about appropriate recommendations for planning combined water screening plants. More stringent effluent standards for phosphorus not only reduce the overfertilisation of surface waters but also increase the recoverable concentration of this finite resource contained within sewage sludge. An efficient process technology for phosphorus elimination is flocculation filtration with the HUBER Sandfilter CONTIFLOW®. A "STAR" for Star city: A new HUBER fine screen with a folded perforated plate screen basket reliably separates all disturbing materials on the sewage treatment plant of Star water and sewer district. With its high hydraulic throughput capacity, the screen fulfills an important role in protecting the downstream membrane bioreactor by eliminating as much solid screenings as possible. The ravages of time are taking their toll: Are your pump station shafts still hygienically safe and are they secure? We offer you tailored reconstruction proposals - safe, durable, corrosion-resistant! On July 5, we celebrated the symbolic groundbreaking for the expansion of the HUBER production hall by another 2,600 square metres. The ceremony was attended by high-ranking politicians, among them Bavarian State Minister Albert Füracker. We are increasing capacities in final assembly and improving the flexibility of the dispatch department. At the beginning of September, 16 trainees and one dual education student joined us to start their professional career at HUBER SE. To make their start on the "serious side of life" easier for them, the HR department had prepared an introduction program for the new trainees to make them familiar with the company and their new colleagues. On 18 October 2018, the official groundbreaking took place for the erection of the new company building for HUBER China in the Shaxi District of Taicang (Jiangsu province). New office and production facilities with a size of 13,000 m² are under construction in the northwest of Shanghai. Our stand at IFAT 2018 was highly frequented by visitors also this year. Numerous water professionals from all over the world used the opportunity to obtain first-hand information. 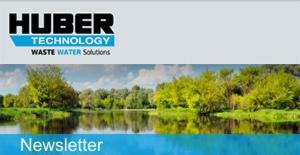 They were visibly impressed by the innovative solutions and HUBER’s capability. Watch our short video to enjoy a review of our successful IFAT presentation.